There was too much traffic. I'll try to get one next time. Had Frosta serviced today, so I poked around the showroom. They have an 2018 STi Type RA for sale right now. Pretty hot ride. To my chagrin, the dealership put an additional $10,000 dealer mark-up on the price. The base price of the Type RA is already as much as an M240i XDrive and approaching M2 money. An extra $10k is more than M2 money. I'm not sure what you're getting over the BMWs besides rear doors and AWD relative to the M2. Can't really say reliability, since it's not like EJ25 engine has ever been especially reliable. But, I suppose they only need to find 500 well-heeled Subaru fanboys nationwide. 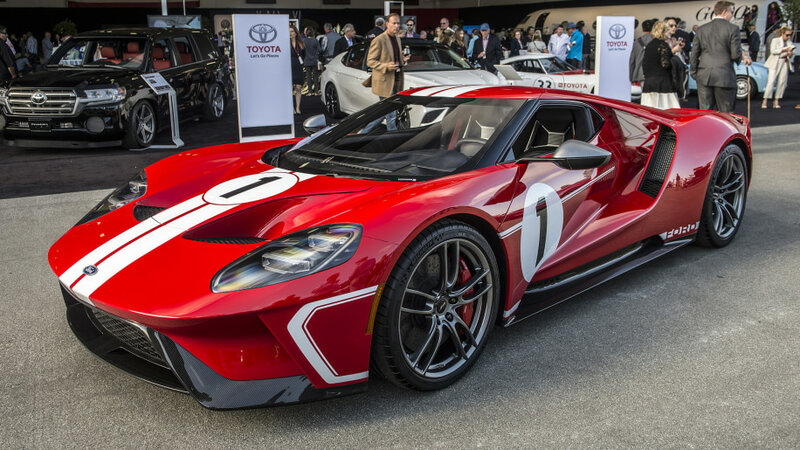 Driving by a RaceTrac, on my commute home, I looked left in time to see a GT getting some gasoline that looked just like this. Wouldn't expect to see one out for a rush hour drive. Edit: the GT is so hawt! 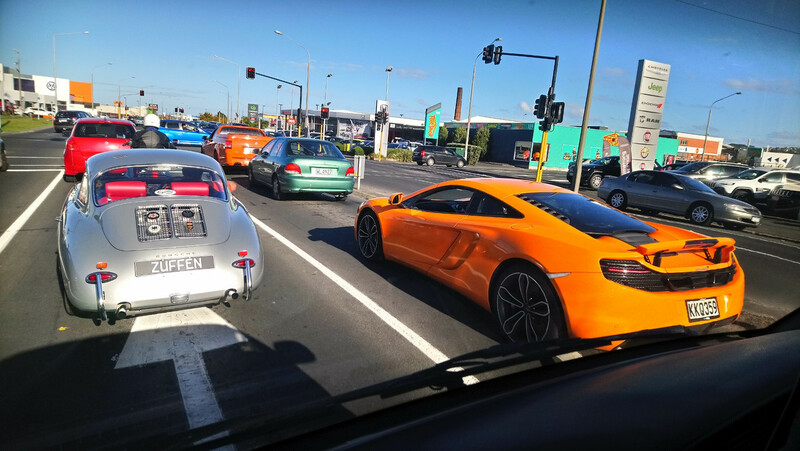 And here's the McLaren i mentioned above that i've seen around town a few times now, and know where it lives, but this is the first time i've been able to get a decent pic of it (have another, of it way in the distance) right in front of us at the lights this arvo. And it's the first time i've seen the Porsche 356 in front of us, but recognise the owner and know he's got a lot of nice cars (SLS AMG, 991 911 GT3 RS which he's raced in Targa NZ before and won, and so on). Neat. Personal preference, but not a fan of the flair on the Porsche. Let the car speak for itself. The warm weather is starting to bring some of the fun cars out on the road. Took the DMC out on Saturday night, was fun. Driving it as night is even weirder as you can see the camera flashes from other people on the highway. Need to get my tint appointment setup soon as being other peoples Notable car sighting will get old quick I think. Maybe someone else can corroborate this - I think I saw/heard a newer Raptor (non-V8) at a distance under heavy throttle, not sure if it was stock or had some exhaust work but it sounded not unlike a delivery truck missing a muffler. It gave me the sad. Someone here at the office has an effing sweet '68 Chevelle SS, saw it for the first time yesterday. Now, *that* thing sounded ace. ...being other peoples Notable car sighting will get old quick I think. Agreed. It's one of the reasons I like my older, stock Honda Accord in the stealthy power beige color with no stickers, personalized plates, tinted windows, or anything else to look memorable or even noticeable. I got called out once at work when I was about 20 years old by someone I worked with who saw me driving like a jerk that morning in my bright blue VW Beetle with personalized plates and I've never forgotten that. I've always thought it would be fun to have a plain jane car from an obscure brand that you don't see many of in the US (a Mitsubishi or Suzuki, for example) and take all the badges off. Police officer: "Okay, let's see if have your story straight, ma'am. You said the reckless driver caused you to swerve off the road, jump the train tracks, flip end-over-end down the cliff, and crash through the ice into the frozen lake, where your car burst into flames. Is that what happened?" Lady on stretcher, being loaded into ambulance: "That's right, officer." Police officer: "What kind of car was he driving?" Lady: "Well, it was a...um...silver or grey...uh...vehicle..."